Map It! Okinawa: "Okawa the Natural Spring in Kin Town"
Okawa is the name of the Natural Spring in Kin. You can park off to the side. Some people stop by to collect the water for variety of reasons. Some will clean their clothes there (it doesn't happen often). Nevertheless the water does look clean and fresh. I drank the water...and still alive. Drink at your own risk. It does look fresh though. If it is a hot day...you will be tempted. Okawa is a great place to sit and have a lunch or a short drink. Okawa is off Highway 329. You will see a 'Family Mart' before you turn off to the road to go to Okawa. The road is downhill and is covered by green asphalt. 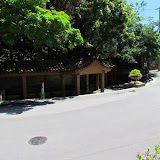 Other places of interest nearby: Statue of Oshiro Kozo, Kin Kannonji Shrine, Kin Watch Tower, Kin's Castle Rock, Richamocha Cafe, The Gold Hall, Kinjo's Used Goods, Kin Town's Hidden Nature Trail, Statue of Toyoma Kyuzo, Birth Place of Toyoma Kyuzo, Kin Town's History Chronicles, Kin Town's Cherry Blossom Way. This joint looks aweful familiar too me ! 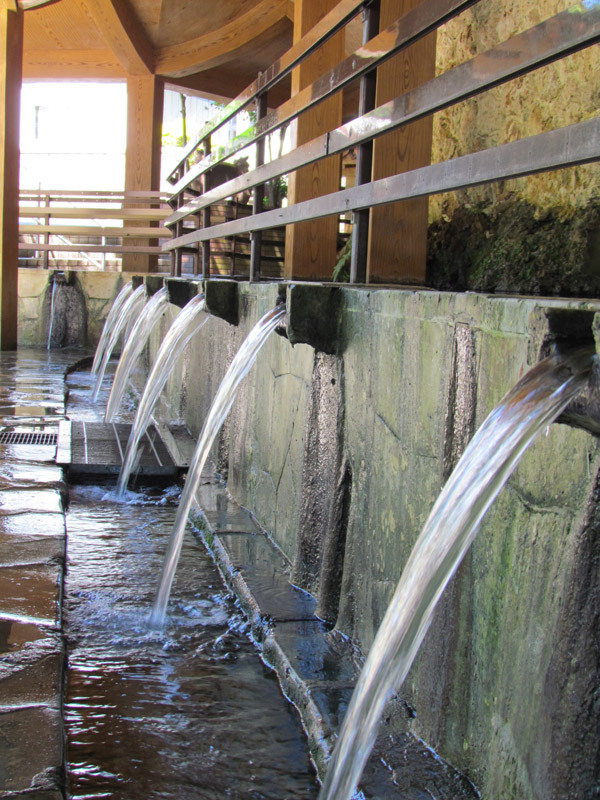 The Spring touts itself on signs and literature as flowing with 1000 tons of water a day. Yeah, right. I decided to challenge that figure. Last year, I spent an hour there taking numerous careful measurements at each and every spout, and averaging out the real flow for the whole spring. Jeez... much to my surprise, when I ran my "science experiment" the row of spouts were putting out over 2000 tons a day ! With the rainy season under way, I recently went by, and could easily see that it was putting out even more ! I wouldn't be surprised if it was 2,500 to 3,000 tons a day right now. In any case, I was quite humbled by my back-fired attempt to prove that the "1,000 tons a day" claim was most likely an exaggeration to get tourists. I told both the Kin Town office and the Kin Education Department of my findings, and went on my way quite satisfied that Okinawa continues to astound me in the oddest ways. That's some Experiment there Rob! It must have been some process to get that figure. Thanks for sharing and reinforcing the claim if not more. Yes, Okinawa continues to surprise me in many ways. Saw a snake here yesterday that I thought didn't exist on this island. Made my day!